A visit to the Krampus haunted house with Michael Dougherty & David Koechner! After director Michael Dougherty’s Halloween horror anthology Trick ‘r Treat was barely released in 2007, it somehow, miraculously, found the audience that appreciated its blend of humor, imaginative production design and scares on DVD. Now Dougherty is back and ready to take on Christmas with Universal and Legendary’s slice of holiday horror titled Krampus, and we had the chance to do an exclusive video interview with him and actor David Koechner (Anchorman, Final Destination 5) at the Scarehouse in Pittsburgh. Currently housing both Krampus and Trick ‘r Treat-themed haunted house attractions, we had the chance to do a special video walk-through of this maze of terrors, as did Koechner and Dougherty! Check out the videos of the interview and our tour of the haunted house below, along with a gallery of pictures from our visit to the Scarehouse! 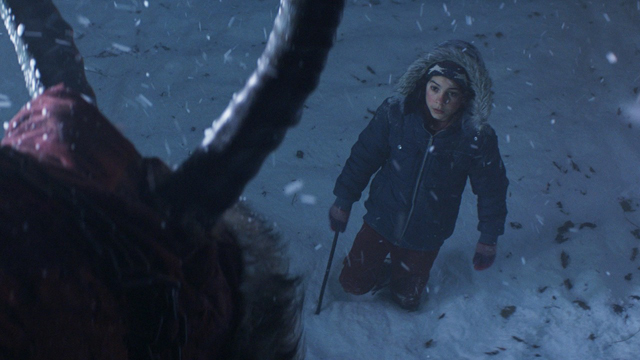 Based on the figure from German folklore, which has had a pop culture resurgence in recent years, Krampus follows a young boy named Max (Emjay Anthony) whose dysfunctional family disillusions him about Christmas. Little does he know, this lack of festive spirit has unleashed the wrath of Krampus: a demonic force of ancient evil intent on punishing non-believers. All hell breaks loose as beloved holiday icons take on a monstrous life of their own, laying siege to the fractured family’s home and forcing them to fight for each other if they hope to survive. Written by Dougherty, Todd Casey and Zach Shields, the film stars Adam Scott, Toni Collette, David Koechner, Allison Tolman, Conchata Ferrell, Emjay Anthony, Stefania Owen and Krista Stadler. It will be released by Universal Pictures on December 4. The post Shock Video: David Koechner & Michael Dougherty Talk KRAMPUS appeared first on Shock Till You Drop.